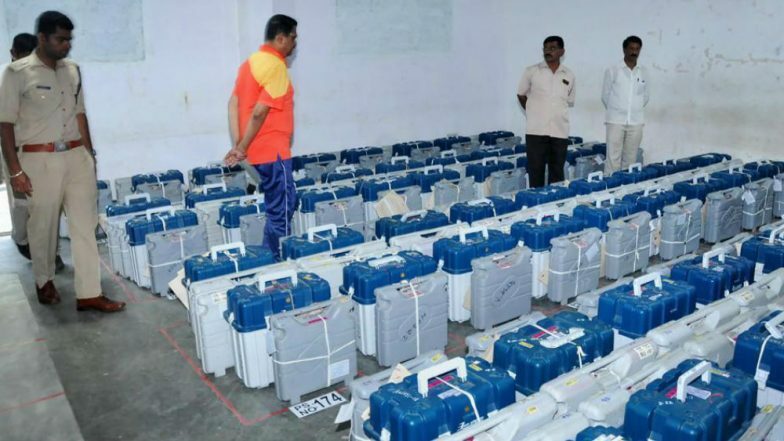 Hyderabad, April 15: A Telangana BJP candidate has petitioned the Election Commission seeking permission to put his own lock on the strongroom storing the electronic voting machines (EVM). His letter, requesting permission from the Returning Officer, is yet to elicit a response from the polling body. Experts, however, consider it unlikely to be accepted. TRS Polling Agent Arrested For Taking Photograph Inside EVM Strongroom in Malkajgiri Constituency. The candidate, Arvind Dharmapuri, had contested from the Nizamabad constituency in the Lok Sabha elections 2019. The seat, along with all other parliamentary segments in Telangana, went to polls in the first phase of the elections, scheduled on April 11. The Nizamabad seat is currently held by K Kavitha, the Telangana Rashtra Samithi (TRS) leader. The BJP led a high-octane campaign in the constituency, with party president Amit Shah addressing four rallies in the seat. Dharmapuri's demand to put his own lock at the strongroom comes two days after a TRS polling agent in Malkajgiri constituency was arrested, after he photographed himself inside an EVM strongroom.